Walmart Is Eliminating People Greeters. Workers With Disabilities Feel Targeted NPR has found that Walmart is changing the job requirements for front-door greeters in a way that appears to disproportionately affect workers with disabilities. John Combs is a "people greeter" at a Walmart in Vancouver, Wash. But he has been told that come April 25, his job is going away. And he is not alone. Combs has one of Walmart's trademark front-door jobs: He's a "people greeter" at a store in Vancouver, Wash. But, he was told, come April 25 his job is going away. And he is not alone. According to Walmart, greeters are being removed at about 1,000 stores around the country. NPR has found that Walmart is changing the job requirements for front-door greeters in a way that appears to disproportionately affect workers with disabilities. Greeters with disabilities in five states told NPR they expect to lose their jobs after April 25 or 26. Walmart is the largest private employer in the U.S. and has a large workforce of workers with disabilities. And the job of greeter has been a particularly attractive fit, as it isn't physically strenuous and is easy to learn. But Walmart has been eliminating greeters and replacing them with "customer hosts," who have expanded responsibilities, such as taking care of security or assisting shoppers. The change is going into effect at the end of April. It is the latest wave in a policy that Walmart started in 2016. It has already affected about 1,000 stores. According to interviews with workers and documents reviewed by NPR, to qualify for these new host positions, workers must be able to lift 25 pounds, clean up spills, collect carts and stand for long periods of time, among other things — tasks that can be impossible for people with disabilities. Workers say they've been told they must be able to climb a ladder to qualify for some of the other jobs at the store. Combs with his labradoodle, Red. His biggest worry if he loses his Walmart job: "How will I feed Red?" "I don't want to lose this job. This is a real job I have," says Combs, as he lets out a deep sigh. Four days a week, he wakes up at 6 a.m. to make it to work by 10. In October, his family threw him a party to mark his two-year anniversary at Walmart — even his sick mother celebrated. Including Combs, five Walmart greeters with disabilities who fear they will lose their jobs in April have now spoken to NPR, either directly or through a family member. They are in Florida, Pennsylvania, Washington, Alabama and Maryland. The workers also said the changes were affecting their co-workers who are elderly or have disabilities. "We recognize that our associates with physical disabilities face a unique situation. With that in mind, we will be extending the current 60-day greeter transition period for associates with disabilities while we explore the circumstances and potential accommodations, for each individual, that can be made within each store. This allows associates to continue their employment at the store as valued members of the team while we seek an acceptable, customized solution for all of those involved." NPR has also learned of several complaints against Walmart with the Equal Employment Opportunity Commission, as well as a lawsuit — all by greeters with disabilities who previously lost their jobs after demands changed. Walmart has reportedly filed a statement in two of the EEOC cases but had not provided a copy to NPR as of publication time. The company has not yet responded to the allegations in the lawsuit. One EEOC claim was filed in October by two cousins in Michigan, both of whom use wheelchairs and say they lost their greeter jobs last year. Another has been filed in Wisconsin, where a former greeter says that last year, she was forced into a worse-paying and more physically demanding job. A third claim is pending in Texas, where a greeter with cerebral palsy says she has been on an extended leave of absence since her job changed in mid-2017. One more greeter, who lost his job in Utah in 2016, sued Walmart in January. "We had heard isolated incidents in the past, maybe two in the last three years, but starting on Monday, we got an influx of calls," said Cheryl Bates-Harris, senior disability advocacy specialist at the National Disability Rights Network. That was Feb. 18, when the story of a greeter in Pennsylvania went viral on Facebook. As of Friday, at least a dozen Walmart workers in seven states had reached out to local groups for help, Bates-Harris said. All of them had been told their job descriptions had changed recently or in the past. None of the workers, their legal guardians or lawyers have seen any paperwork that explains the policy or its timeline, they told NPR. When Walmart Comes To Town, What Does It Mean For Workers? "It's been very stressful," said 32-year-old Mitchell, who says his job as a greeter is being eliminated in Alabama. He has done the job for four years. "It gives me a place to go every day, where I'm not sitting at home. I'm not one of these people in the wheelchair that want to draw Social Security. I'm able to work; I want to work; I want to be out in society." NPR is not sharing Mitchell's last name because of his fear of retribution from management. Two other workers and their guardians similarly spoke to NPR only anonymously for fear of upsetting local managers. 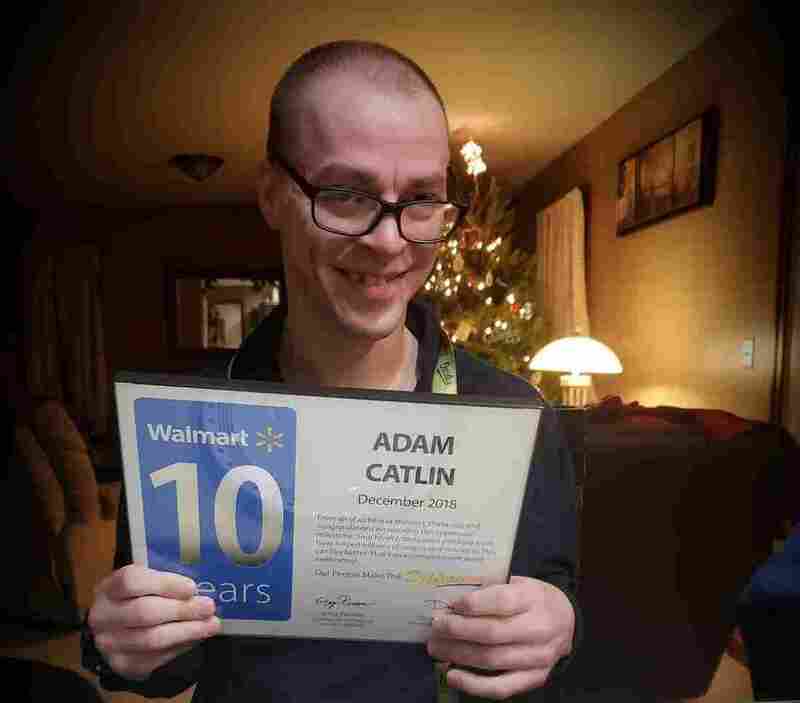 The most widely shared story has been in Pennsylvania, where Adam Catlin, a Walmart greeter with cerebral palsy, is facing job loss after 10 years. Almost 4,000 comments have poured onto his mother's Facebook post, which asks people to call Walmart's corporate line to advocate for Catlin's employment. "They told me that the job code would be changing, and I have to be able to stand up and lift 25 pounds," Catlin, 30, told NPR last week. "I asked them for suggestions and the manager said he didn't know what to tell me." The legal implications are complicated and depend heavily on each store's response to each affected greeter. The Americans With Disabilities Act does not preclude companies from changing their job descriptions and expected job functions as they see fit for their business goals. Retailers are under a lot of pressure to keep down costs, and Walmart in particular has been jockeying for dominance against one of its biggest rivals, Amazon. In the last quarter, a notable chunk of Walmart's profits came from its online grocery business. And the chain does rely on the staff at the front of its stores to help shoppers load bags into their cars. "An employer can change the nature of the job given its business needs, but then you still have the requirements to help a person, who's disabled, do that job," said Jonathan Mook, an employment lawyer at DiMuroGinsberg who specializes in the ADA. He said an employer could offer the displaced worker an "equivalent" job, find ways to adjust the requirements to the worker or even grandfather in the long-term employees. But it's all at the company's discretion. "What [the ADA] requires is an interactive process," Mook said, "some type of dialogue with the person with a disability, in terms of seeing whether or not there's something that could be done to help or enable that person to do the newly designed or newly configured job." The ADA's requirement is for companies to provide "reasonable accommodations" for workers with disabilities facing changing job demands, as long as the worker can perform the "essential functions" of the job. And the question of whether stores satisfy this standard will have to be answered on an individual basis. In the case of Combs in Washington, his sister Rachel Wasser said the store has not offered any new positions or severance. As for Catlin from Pennsylvania, Walmart has met with him and his family, but they have not reached any resolution yet. In the lawsuit filed in Utah, former greeter Manase Yokwe alleges that in mid-2016, greeters were asked to raise their hands if they couldn't work while standing — and those who did were later asked to consider severance agreements. Yokwe's lawsuit also alleges that at least two other greeters with disabilities did not get new jobs at the store. 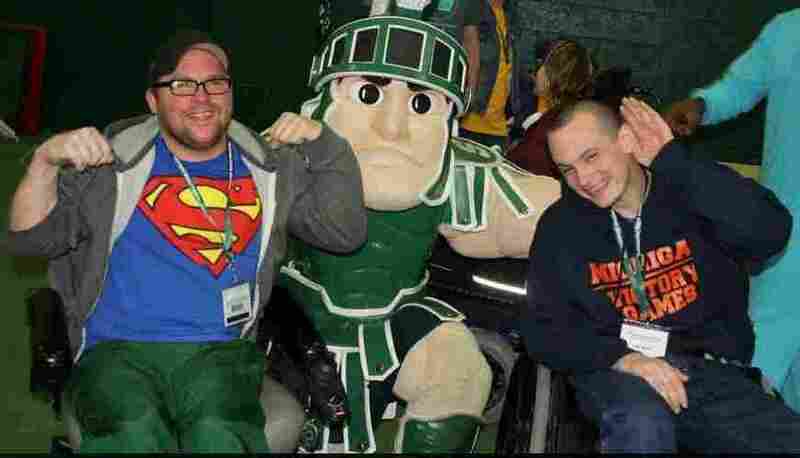 In Michigan, cousins John and Joe Wirth, both of whom use wheelchairs and have filed an EEOC claim against Walmart, say their local manager did not help them find new jobs at the store when their greeter positions were phased out. They also claim they were pressured to sign papers saying their departure was voluntary, to receive their final paychecks. In Joe Wirth's separation notice provided to NPR, an inscription says he was leaving for "career opportunities." The Wirths also provided a statement from their former co-worker, a third greeter with disability, who also lost his job last April after 12 years at the store. "I don't think they're really invested in the greeters, and that's a shame," said John Wirth, 36. On his last day at Walmart in April, he said he took his usual two buses to clock in, only to discover his badge didn't work. He was told to turn in his vest, badge and five-year pin. "They maybe said good luck with whatever you decide to do," he said. "And that's after almost 12 years." Walmart has had a complicated history as an employer of people with disabilities. It has had a "Diversity and Inclusion" initiative since 2003 and has executives dedicated to disability inclusion. In a 2017 report, it said it received a top score on the "Disability Equality Index" for two years in a row. The index is assessed by a group of disability advocates and business leaders. 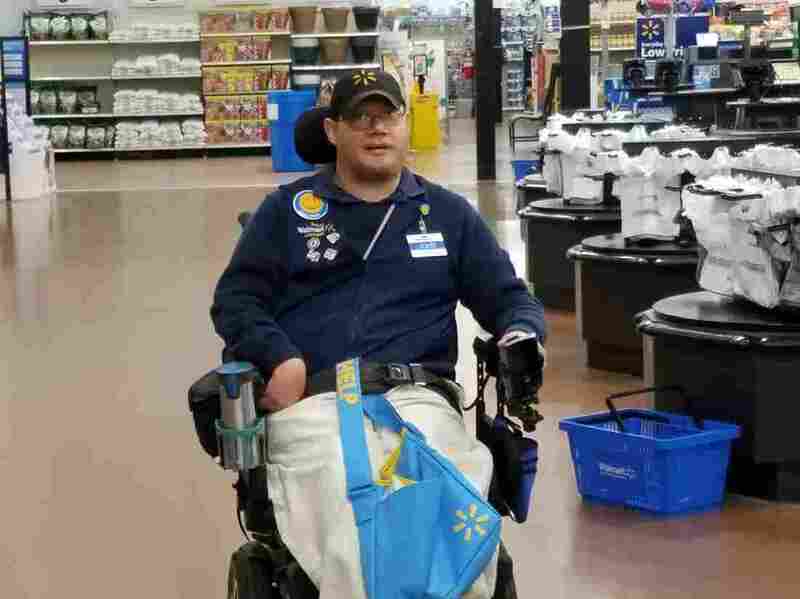 Walmart also said it was "named a 'DEI Best Places to Work,' in recognition of enterprise-wide initiatives focused on advancing disability inclusion." But the company has also historically faced a slew of ADA lawsuits and in 2001 reached a $6.8 million nationwide consent decree with the EEOC as it settled 13 ADA cases related to disability-related questions it asked job applicants in a "pre-employment questionnaire." In 2005, Walmart faced outcry over a leaked internal memo that proposed cutting soaring health costs by, among other things, requiring that all jobs include some physical activity. The workers and their families feel devastated by the latest eliminations of greeter jobs. Fred Wirth — Joe's father — said his son felt stabbed in the back after serving six years at Walmart. 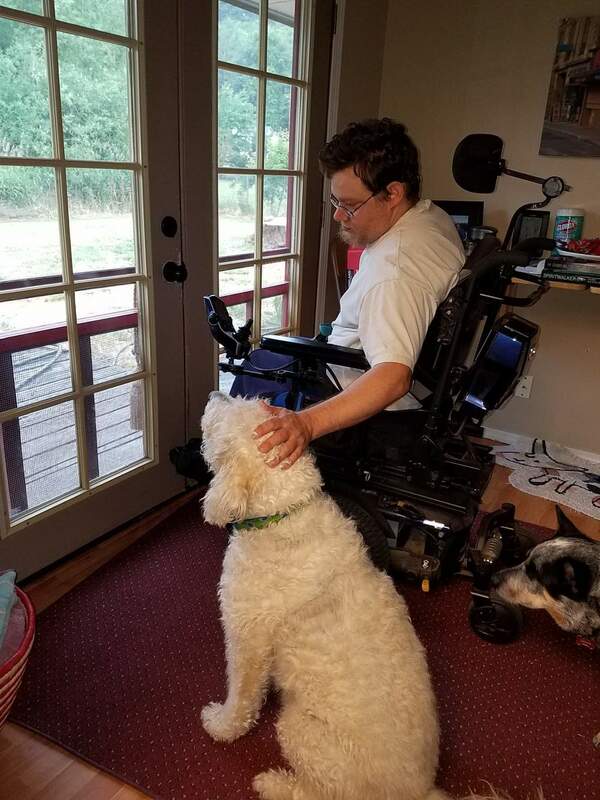 "I'll tell you our view is we think it's just a systematic way of getting rid of all the disabled people," Fred Wirth said. "Whether that's right, wrong or indifferent, that's how we kind of saw it." NPR's Phyllis Fletcher and researcher Will Chase contributed to this report.